A court ruling calls for major reevaluation of Columbia and Snake river dams. Ruling calls for major reevaluation of Columbia and Snake river dams. "Pacfish" proposal would protect riparian areas of northwest. Len Lankford manages private Colorado forests for sustainable yield. Groups urge better use of Land and Water Conservation Fund. Methow Forest Watch making a difference in Northwest forests. Survey shows federal recovery money goes to well-known, favored species. Colorado Environmental Coalition seeks to identify remarkable rivers. Video shows how Oregon Watershed Improvement Coalition helped improve Oregon watersheds. League of Conservation Voters say Western politicians have some of the worst environmental voting records. RecycleNet electronic bulletin board encourages sharing of recycling information. Student Conservation Association seeks speakers. Wolves to be reintroduced into Yellowstone National Park as experiment. Hopis want Navajos to stop mass producing kachinas. Legislation to seal abandoned mines threatens bat habitat. Bureau of Land Management tries to outmaneuver opponents of predator control. Northwest legislators want sea lions killed to protect steelhead. Wyoming environmental group gets Bureau of Land Management to reconsider the route of a natural gas pipeline over historic South Pass. U.S. Fish and Wildlife Service's Grizzly Bear Recovery Plan will fail, groups say in lawsuit. 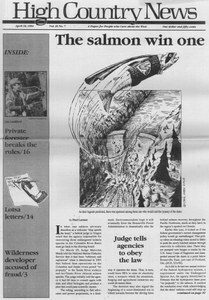 Idaho Fish and Game goes against Gov. Cecil Andrus' wish and opposes Owyhee Canyon bombing range.